I’ve been thinking about dyeing fabric (and yarn) for a few months now. I have some beautifully dyed fabrics and garments lately and heard interviews with great natural dyers. 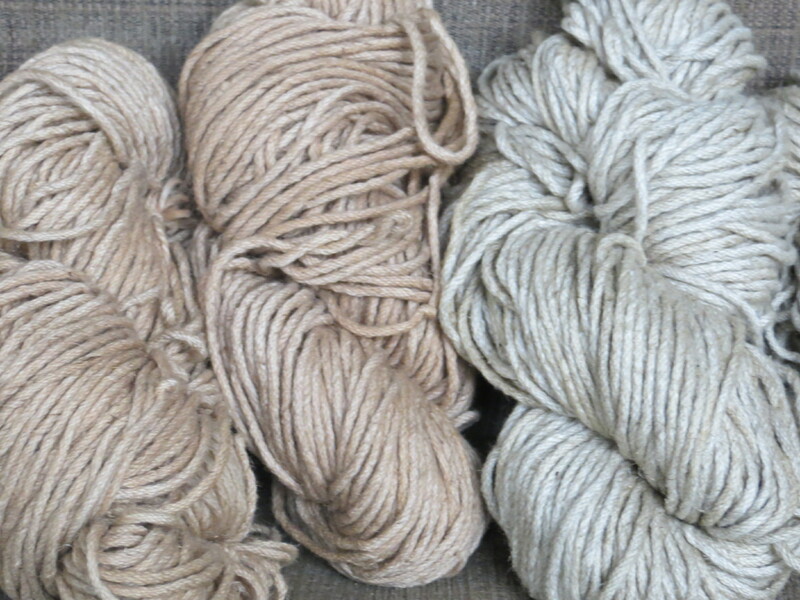 Natural dyes appeal to me, not just because I tend to avoid harsh chemicals and poisons for our health, but also because I am drawn to a muted color pallet. While I know that natural dyes are not non-toxic and can also make vibrant colors, most are safe and I knew I would be likely to turn out those muted colors (not being terribly fastidious). Also, we live in a great place for finding dye plants in nature–black walnuts, golden rod, etc. 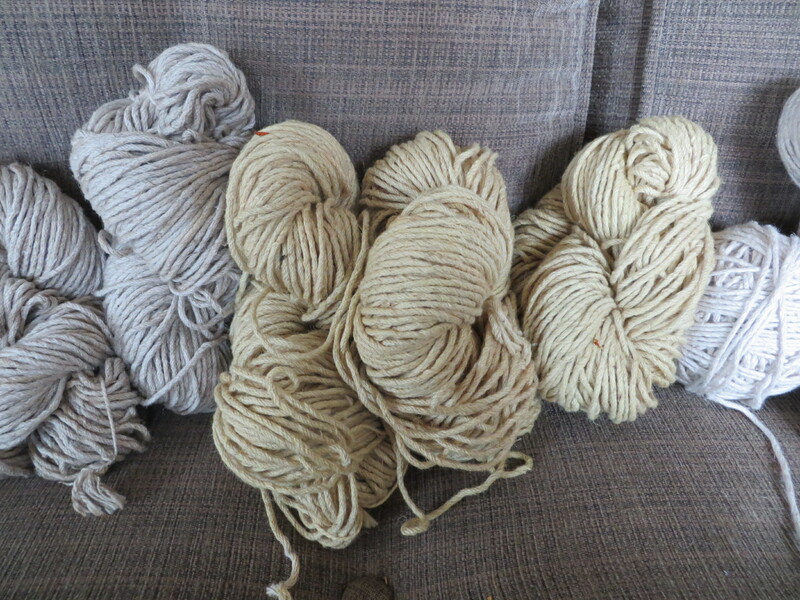 So, when I found 12 skeins of undyed linen cotton blend yarn at a fiber yard sale a few weeks ago, I bought them, thinking they would be great for experimenting. There are many, many different ways (often conflicting with each other) to dye fiber depending on the fiber, color, mordant, and so on. 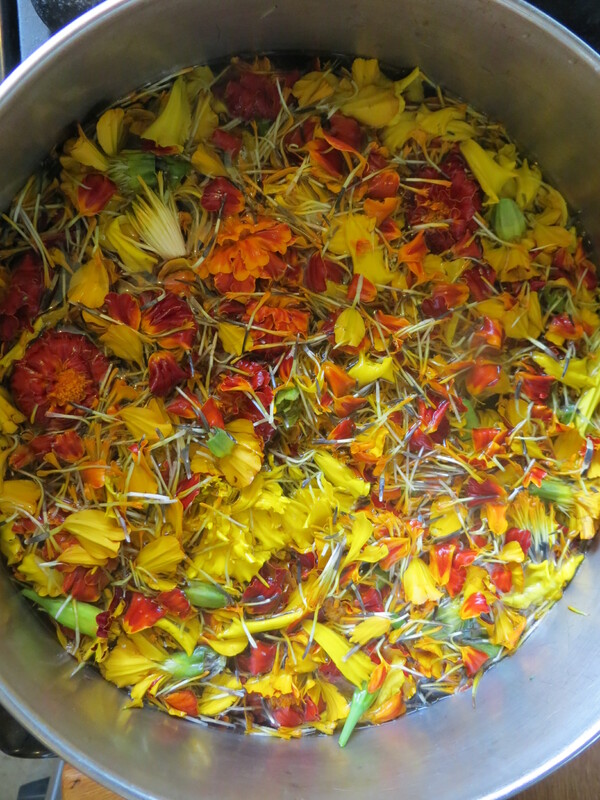 First, I picked nearly all the heads off of my 5 marigold plants, which are blooming prolifically right now. 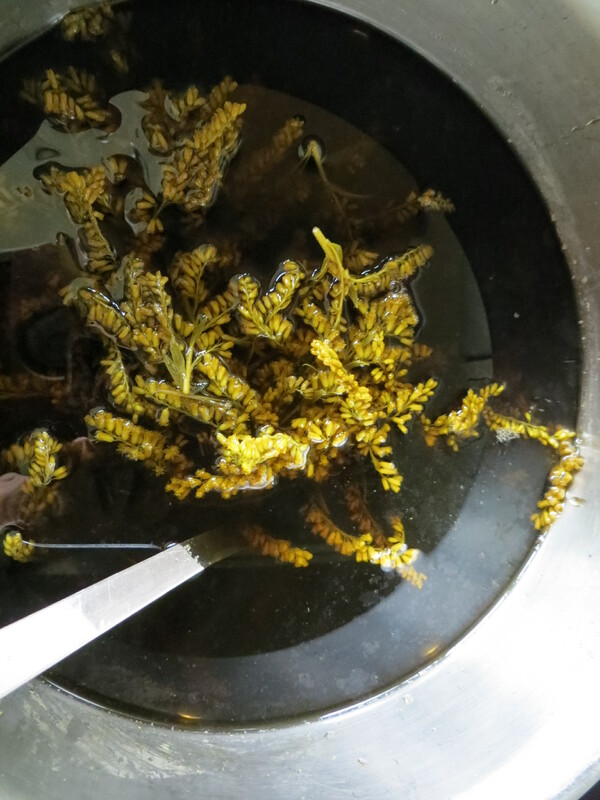 I used alum and cream of tarter as my mordant, soaked the yarn in water, simmered it in the mordant, simmered the marigold leaves, and finally, soaked the yarn for 24 hours in the dye bath. At first, it looked yellowish brown, but once dried, was a pretty yellow. 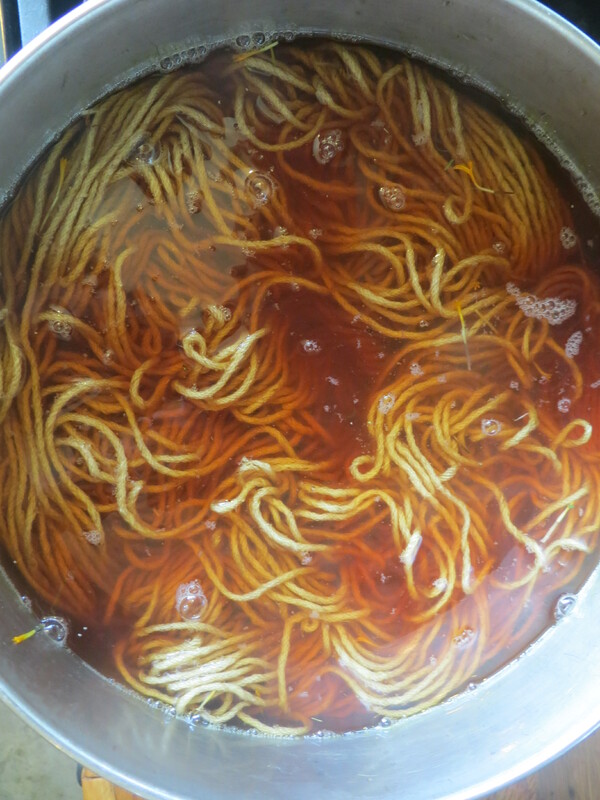 Then, I used black tea as a dye and mordant (tannic acid) and just simmered the yarn, then soaked it for 24 hours in the tea bath. It came out a very pretty muted brown. Finally, I used golden rod with iron as the mordant (rusty nails from the tool shed). This did not turn out as pretty as I thought it would. The yarn was very dull, not too different from un-dyed color, but a slight greenish color. 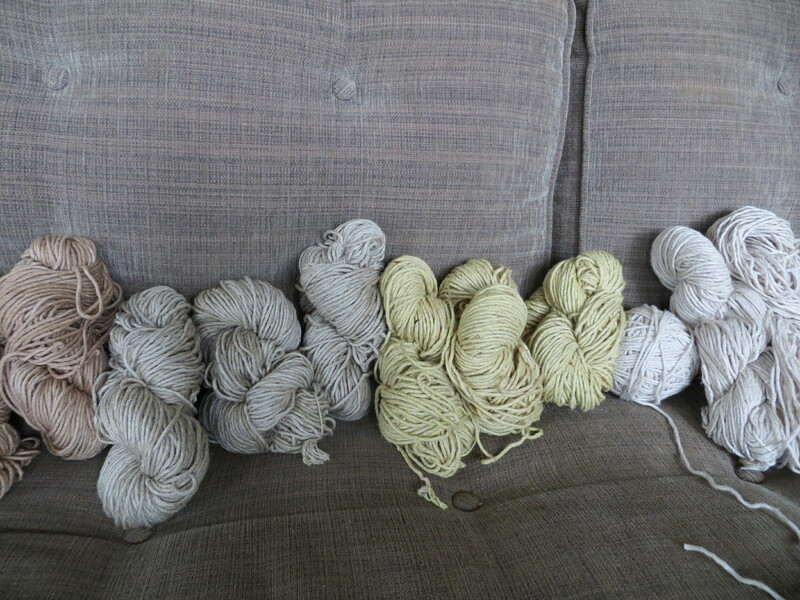 You can see all the colors below, with the undyed yarn, too. I think I am going to knit a striped throw to have for this couch. Overall, I am pleased, and very excited to try some more dying. What to dye next? Right now, the golden rod and marigolds are still in full bloom and black walnuts are starting to fall. Should I find some fabric or yarn? I thought you could re-dye yarn if you wanted to change the color. Yarns look good! I think you can. I am not sure I am going to attempt, but maybe I should try the goldenrod again! I am thinking of picking the flowers now, freezing them and using them for dyeing later, when I might have more time (or actually have fabric and yarn to dye).